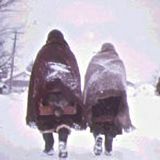 A large, four-cornered blanket, which is laid over the shoulders when going out for an errand during the cold and snow. 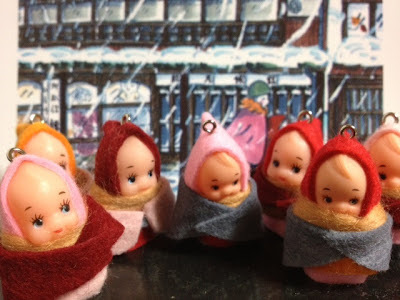 They are used in most parts of Tohoku.
. kaku maki 角巻 square shoulder shawl . 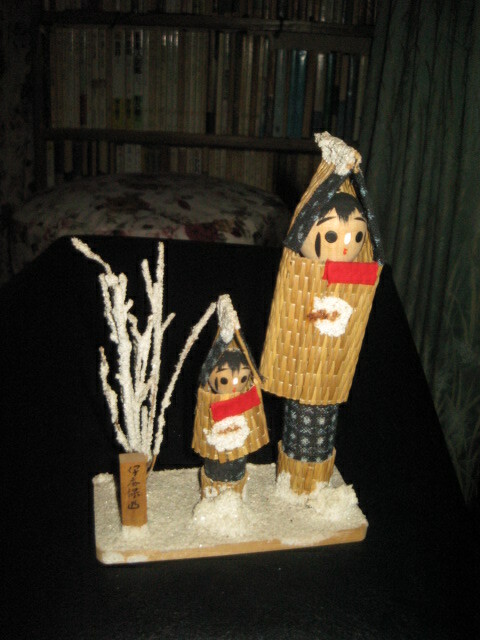 Made by Satoo Fujio 佐藤不二夫 Sato san of Ichinomaki town. His home is full of antique dolls, paintings and other things. 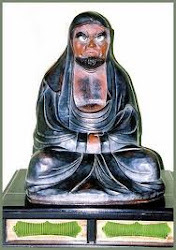 The Jizo statue is unique and he never made another one. 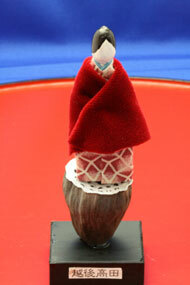 But after he found the fine piece of gingko biloba wood, he used this to make his dolls. The Gingko tree grows in most school yards in Iwate, and he got the extra branches that had to be cut off to keep the windows free during the March holidays of the local schools. 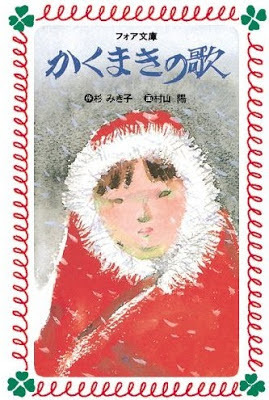 The colors mostly uses are benibana for red, yomogi for green and black sumi ink for black. The size is best at 6 sun 5 bu 六寸五分, about 19 cm. He made each doll with special care and attention and took a long time for each one. Therefore he could not find another doll maker to carry on after he stopped working. 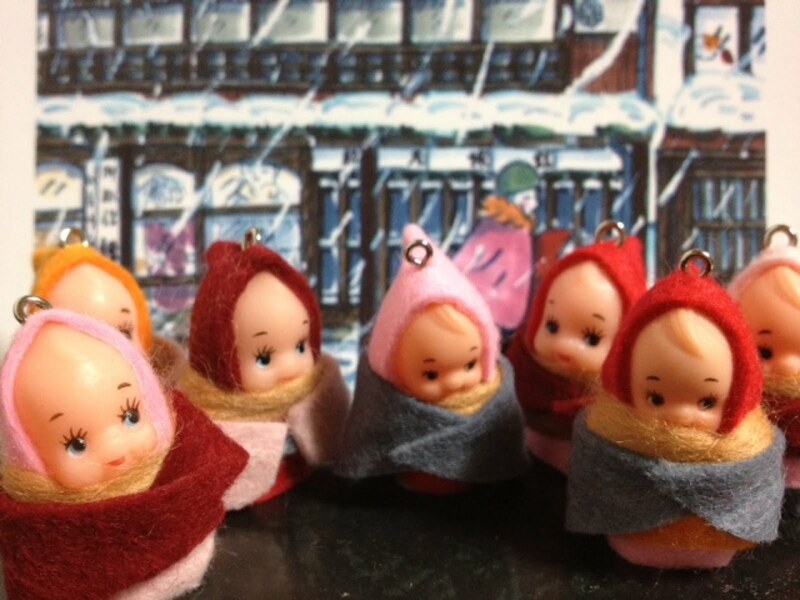 Sato san stopped making dolls in 1988, but they were sold in most souvenir shops in Ichinoseju at his best times. He was a teacher at Ichinoseki Middle School for many years. 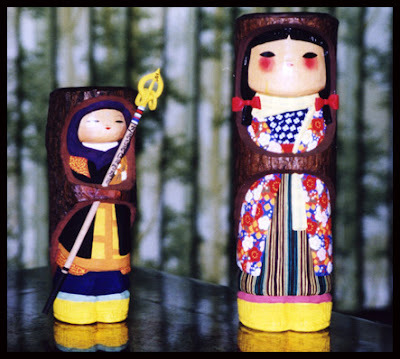 Most of the dolls have a shawl made from the bark of the wood used for making the doll. Many wear blue monpe pants with simple patterns. 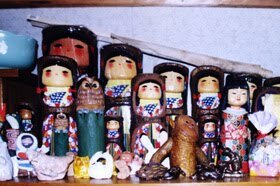 They also wear straw boots as the people of the region did in winter.
. はすの実人形 Lotus Seed Dolls .
. Kokeshi, Wooden Dolls こけし, .
. Kewpie Doll Daruma だるまキューピー . at the corridor . . . 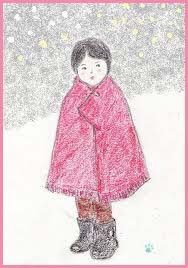 Written about the time when the writer went to grammar school in winter. The father had to bring the children in the morning and mother came when the school was over to pick them up.